Photography plays a major role in history and in the future. Photojournalists have an extremely important job in the world; to archive history. In the relatively short life of the art of photography, tremendous advances and changes have occurred at lightning speed. From the creation of the camera obscura, to the first permanent image in 1826, to smart phones which allow users to photograph their surroundings instantaneously, photography is constantly changing. The evolution of the camera has changed the types of photographs taken of world tragedies and human suffering, in particular, genocide. Visual representations, photojournalistic and otherwise, are important components of many genocide discussions. It may be argued that visual representations and especially photojournalism have contributed a great deal to the delocalization and internationalization of the memory of war and genocide. The quality of images, the number of images, and the accessibility of seeing these images has greatly impacted representations of those surrounding the genocide. The photographs taken are capable of raising political awareness and making the viewers think about both the conditions addressed in the photographs and their own involvement in and responsibility for these very conditions. In particular, the photographs taken during the Rwandan genocide of 1994 differed from other genocide and war photographs from the past due to the terrifying high-quality of the images and the wide-spread visual outlets the photographs had, such as television, the internet, videos, and photographic montages. The modern ability for anyone to take photographs using phones, smaller compact cameras or video cameras has increased the amount of information we can gather from a particular event, and the increasing quality of the images can help people better relate and sympathize to the images they see. In addition, widespread camera availability has transformed taking pictures from a formal procedure to one more discrete, in some instances altering the surroundings of a photograph from prepared and scripted, to natural and genuine. Over the past 30 years alone, advancements the camera has undergone have completely changed the types of photographs we see. The autofocus, digital chip, electronic flash, fast lenses, and LCD review screens are just a few of the major advancements that have drastically affected all of photography. An autofocus optical system uses a sensor, a control system and a motor to focus fully automatically on a selected point or area, providing a quick, instant focus, with just a quick press of a button. This contrasts with manually focusing the camera for each individual shot, which had previously caused the photographer to not only focus his attention on operating the camera instead of the scene they were photographing, but they took much longer to focus the camera manually, resulting in less pictures to be taken. The digital chip, or card, took the place of film. By advancing to a camera chip, it is possible to store thousands of photographs on the camera at a time, and it cut the time and hassle of replacing the film and storing it until being ready to develop. The advancements of a flash also have had tremendous impact on fast-paced photography. A major purpose of a flash is to illuminate a dark scene. Other uses are capturing quickly moving objects or changing the quality of light. The development of automatic flash photography eliminated the hassle of calculating the distance of your subject to your flash to figure out the proper exposure needed. Before the automatic flash, using the flash was a chore and getting the correct exposure was at best an educated guess. Modern cameras now have the ability to use multi-flashes, change the flash intensity with just a few clicks, provide flashes with LED illumination (usually used with cameras on cell phones), and focal-plane-shutter synchronization. The progress of the camera lens has been substantial in assisting photographers with taking photographs faster and with higher quality. Back in the 70s, most long lenses were big, clunky and hard to focus because exterior parts of lens rotated stiffly. No automation was available, and the settings needed to be made manually. Modern camera lenses are much smaller, easier to handle, and take less time to change if needed. The next major change was internal focusing; this design created faster, lighter and sharper lenses used today. One of the final major developments of the camera is the invention of the LCD review screens. Before this improvement, the photographer had to wait to see what develops. Photographers had to undergo a long procedure of processing and developing the film in a dark room, which was messy and expensive. These advancements have greatly affected photography, in particular the photographs taken during times of war and genocide. Human suffering has to be visually represented, because otherwise the victims would be excluded from the political realm and no response to the conditions depicted in a given image would be possible. Without visual representation, victims would literally become invisible. James Nachtwey is a noted American Photojournalist and war photographer, taking striking images capturing the horror of human suffering. He takes advantage of the modern advancements of the camera to show the extent of the suffering, and to initiate emotion in the viewer. He took photographs during the Rwandan genocide that helped spark national attention and action. The clarity and quality of the photos are remarkable, placing the observer in the shoes of someone who was actually there. While talent of the photographer is instrumental to having a significant photograph, you cannot overlook the evolution of technology to credit an impressive photograph. James Nachtwey was able to capture raw moments using his camera, but it was the progression of a smaller sized and portable camera that allowed him to capture those moments at calculated angles, with specific lighting, at given distances. 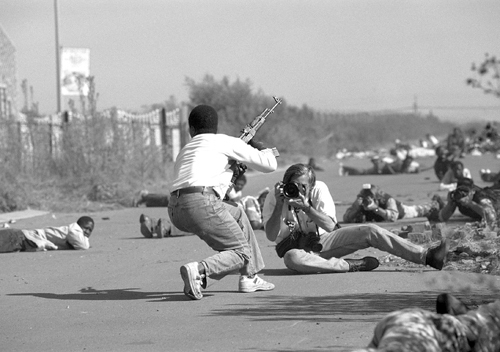 Figure 1 shows Nachtwey in the field, nearly three feet away from a gunman. In addition to pure courage, dedication and talent, he was able to capture such a personal and close-up photograph because of the portability and ease of the automation of the camera itself, showcasing that the advancements in technology have made the photographer more agile than ever before. 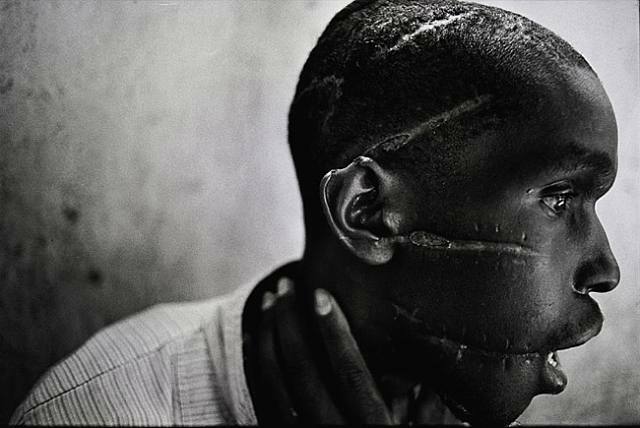 Figure 2 shows another photograph taken by Nachtwey during the Rwandan genocide.This photograph depicts a Hutu man who did not support the genocide; he had been imprisoned in the concentration camp, starved and attacked with machetes. He managed to survive after he was freed and was placed in the care of the Red Cross. Knowing just the description of an event doesn’t always provoke the same emotion as seeing a picture would. Photography influences and alters our relationship to history, memory, and even death. Photographic images can have a large impact on commemoration, history, truth, and the future.. In relation to figure 2, reading about this Hutu man and his story doesn’t necessarily spark the same feeling as seeing the picture of his obvious physical suffering does. With such a high-tech camera, you are able to see precise shadows highlighting his scars, you can see with full clarity the section of his ear that had been cut off, and you can see the raw emotion in his eyes. Before this advanced technology was available, all of these important details that help shape the meaning of the photograph would be absent. Seeing something, as opposed to reading about it, can take someone from being a passive observer to an active observer. The fundamental role photography has in modern culture is a cause for photographs to be of the highest quality. If photographs can cause people to form opinions, generate national attention, inspire change, or generate hope, then advances in modern technology are essential. With Facebook, Twitter and other media outlets being driven by anyone who has a computer, photography plays an even more important role. The photographs spread across the world in a matter of seconds allowing the opposite ends of the Earth to come together to view what they otherwise would have to wait to see in print. Visual documentations of important events are now seen as they happen, in real time. The number of media outlets that photographs are showcased in has generated the largest audience of viewers than ever before. With just a click of a mouse people are able to share photographs instantly, allowing for news to spread like wildfire. In the past, if a national crisis had occurred, the public would have to wait to hear about it on their radios or watch an anchorman discuss the details later that night. With technology’s advancements, as soon as the first photograph is taken, anyone is able to see it instantly. There is no longer a wait to find out details, no delay until the weekly magazine prints fuzzy, out-of-focus pictures hinting as to what is occurring. Photojournalists now have the modern ability to take high-resolution photographs, share them instantly on the television or web, and print them for the paper that day. The increased accessibility and availability of cameras over time has made it much easier for anyone with minimally a cell phone to document history. In the past, cameras were expensive and large in size, so taking pictures was a premeditated event. In events such as the Holocaust and Armenian-Turkish genocide, photographs taken were in attempt to be strictly limited. During the holocaust, the individuals with cameras tended to be supporters of the Nazi regime, so the viewpoint of the photographs tended to only be one-sided, in this case, of the perpetrators. In some photos, members of the Nazi party would be smiling in the picture, as though it was just an ordinary, every-day event. The modern advancements of technology has changed this, allowing cameras to be placed in the hands of larger masses of people. Now, photographs can be taken easily by both sides of a conflict, allowing for opposing viewpoints to be seen. In addition, photographs can now be taken showing a more accurate representation of history, with cameras now being more discrete and able to capture moments quickly and easily. The object photograph doesn’t always have time to set up the scene and prepare their actions, but rather photographs can be taken in the moment without notice. Figure 3 is a photograph taken by another photojournalist, Mariella Fuller. 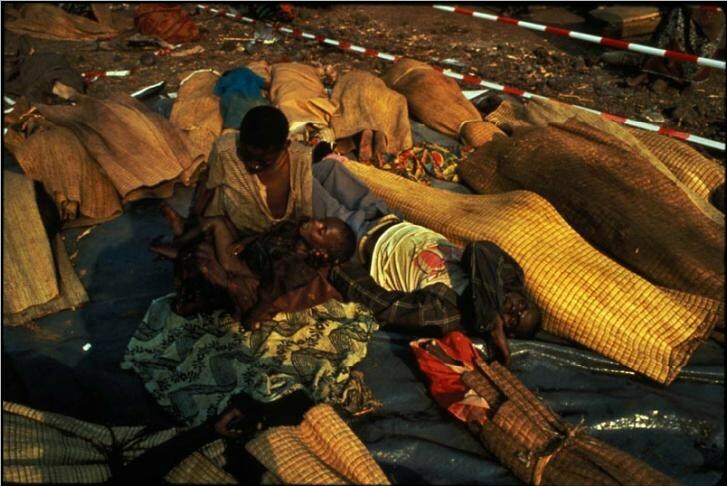 Fuller took hundreds of photographs during the Rwandan Genocide, primarily focusing on taking photographs of children. In this specific picture, it highlights how the scope of what is being photographed during times of genocide is widening. Years ago, this picture would have never been taken, because this is not a photograph the perpetrators would’ve taken themselves. This particular image shows what appears to be a mother holding her dying child, while surrounded by dead bodies wrapped up beside her. Because of the availability of the camera in modern times, this moment was able to be captured, showing not just one side of the event, but also displaying the devastating effects of actions against the suppressed. These types of photographs give a human quality to the victims, something that the opposition is trying to desperately contest. When looking at photographs such as this one, it is reasonable to say that it is difficult to not feel sympathy for the woman. When you see the sadness in her face, the defeat in her body posture, and the utter despair of the environment she is surrounded by, the viewer gets a completely different view of the genocide as opposed to seeing pictures the perpetrators would’ve released. Modern society is inundated with visual stimuli each and every day. Due to this flood of image-centered edutainment, it has been argued whether these photographs of war and human suffering actually teach us about suffering—or if they only numb us over time and simply cause us to turn away. In Susan Sontag’s book Regarding the Pain of Others, she discusses this argument and maintains that the images of suffering shown each day are ignored by those who are unaffected. “Who are the ‘we’ at whom such shock-pictures are aimed? That ‘we’ would include not just the sympathizers of a smallish nation or a stateless people fighting for its life, but—a far larger constituency—those only nominally concerned about some nasty war taking place in another country. The photographs are a means of making “real” (or “more real”) matters that the privileged and the merely safe might prefer to ignore” (Sontag, 7). Even though Sontag’s argument has credit, I would like to challenge that because photographs can be “more real” than ever before, it can be morally difficult for one to just simply turn their head. In addition, while some people may become “desensitized” to the images and are then able to ignore them, that is not to say that this affect is had on everyone. If that were the case, then what would be the point of publishing any images, stories, or news about these events at all? Simply stating that photographs purely aestheticize genocide and violence doesn’t provide any sort of solution. In fact, the alternative to this situation could be even more destructive and dangerous; a world with no images, no information, and no action. If someone wasn’t likely to take action even though they saw images of the atrocities, would they be any more inclined to take action if they read a newspaper article about it? The hope of many photojournalists isn’t that they will affect everyone, but that their work will make enough impact on some people to change the circumstances of those who are the target of an injustice. Instead of publishing fewer photographs for fear of “desensitization,” a greater impact could be had on the public if the photographs were ones that they could not easily look away from and ignore. The advancements in technology have made photographs resonate with viewers in a different way, placing them in the scene where the picture was taken. There is something to be said about the ability to make a photograph “more real,” to the viewer, and to make it seem as if they were there. With modern technology, this quality is able to be present in a majority of photographs taken, as seen through the pictures of the Rwandan Genocide. This genocide in particular is a great example of how the quality of the photograph can change the impact it has, and how the widespread availability of these images can change genocide. With the plethora of high-quality images of these events, it can help explain what happened, how it happened, and make the actions of the perpetrators indisputable. The images can be seen time after time to such a vast audience at lightning speed, it is arguably more likely action can be taken to aid the victims and stop the actions of the people responsible. Moller, Frank. “Rwanda Revisualized: Genocide, Photography, and the Era of the Witness.” CBS Interactive. CBS Interactive Business Network, 01 Apr. 2010. Web. 02 May 2012. <http://findarticles.com/p/articles/mi_hb3225/is_2_35/ai_n55407189/&gt;. “Autofocus.” Wikipedia. Wikimedia Foundation, 04 Jan. 2012. Web. 02 May 2012. <http://en.wikipedia.org/wiki/Autofocus&gt;. “Memory Card.” Wikipedia. Wikimedia Foundation, 20 Apr. 2012. Web. 02 May 2012. <http://en.wikipedia.org/wiki/Memory_card&gt;. “Flash (photography).” Wikipedia. Wikimedia Foundation, 05 Jan. 2012. Web. 02 May 2012. <http://en.wikipedia.org/wiki/Flash_(photography)&gt;. “A Brief History of Photographic Flash.” Photography and Post-processing Tutorials from Beginner to Advanced. Web. 02 May 2012. <http://photo.tutsplus.com/articles/history/a-brief-history-of-photographic-flash/&gt;. “How Products Are Made.” How Camera Lens Is Made. Web. 02 May 2012. <http://www.madehow.com/Volume-2/Camera-Lens.html&gt;. “Framework.” Six Photography Game Changers. Web. 02 May 2012. <http://framework.latimes.com/2012/02/03/photography-game-changers/&gt;. “James Nachtwey.” PICDIT. Web. 02 May 2012. <http://picdit.com/2009/12/01/james-nachtwey/&gt;. “Photographer James Nachtwey ’70 Awarded the Dresden International Peace Prize. Web. 02 May 2012. <http://now.dartmouth.edu/2012/02/photographer-james-nachtwey-70-awarded-the-dresden-international-peace-prize/&gt;. “The Best Free Training.” – Reviews of Some of the Best Free Tutorials, Classes, Self-Study Materials, Videos, Audios, and More. Click! Photography Changes Everything. Web. 02 May 2012. <http://www.bestfreetraining.net/?p=1869&gt;.